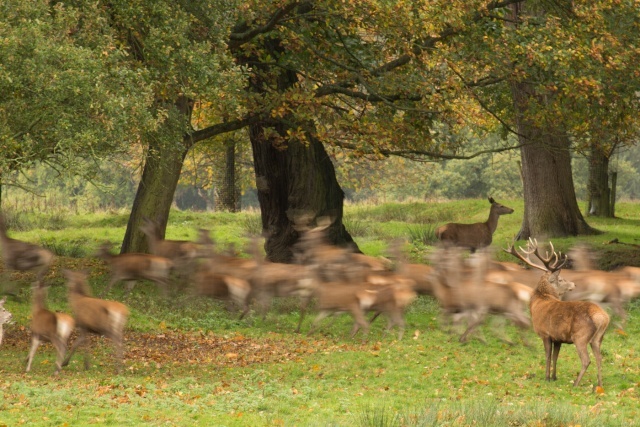 We went to Tatton Park today to try some wildlife photography for the first time. I took this picture of a herd that was scared by a family walking a bit close. The stag and one hind stayed perfectly still but the others scattered. Thing is I can't make up my mind if I like the shot or not. It's unprocessed, as shot. Welcome to the forum and thanks for contributing to the critique section. I won't comment on the colour and tone of the picture as I have a borrowed laptop at the moment and it is very hard to judge how a picture is intended to look. For me the two deer that stayed still are a bit too peripheral in the image. I wonder if you were to crop off the left side of the picture so it becomes almost square in format. Perhaps using the lovely trunk of the tree just left of centre to become the left hand frame of the image. Not got much time to do it justice. Will try to get back later. I love it. Love the motion blur and the contrast with the 2 stationary animals. I think for me, could do with a bit more punch, easily done in post processing. At this size, I can't tell how sharp the stationary animals are. I think a cracking shot. Well done. Just read David's comment. I wouldn't want to loose either of those 2 whole beasts, so going close to the trunk would be too far for me. Hi been looking at the higher res image full screen. Mike I think that you are right it works well as is! Not certain about adding more punch the soft tones look to give the feeling of Autumn well. As I commented before difficult to pronounce as this laptop is pretty horrid because of the critical viewing angle on the screen. Thank you both. I tried the crop in but I think the central mass of moving deer is then quite homogeneous, with the wider view the individuals leading the bolt are clearer, but it certainly gave me another perspective. Mike you said "easily done in post processing", I wish . The limit of my post processing just now is to crop and maybe poke the exposure a bit...honestly I have been working on "in camera" shots and wouldn't know where to start. Every time I try playing with other settings I end up with a mess. I'm hoping the club will organise a basic post processing workshop at some point so I can get my head around it. Thanks again to both of you for taking the time to comment. Depending on camera there is a lot that can be done post exposure in the camera without using an external computer. 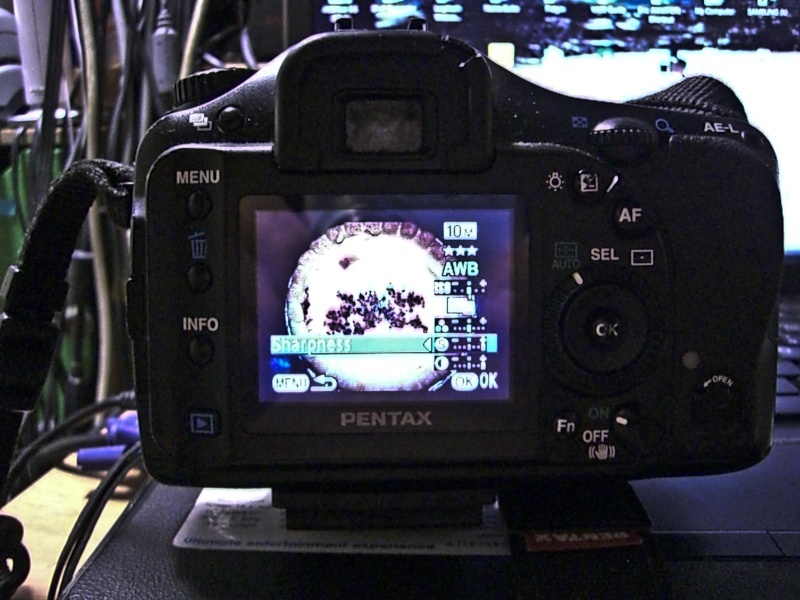 Picture of my cheap Pentax K10D showing how I can adjust sharpness also shows how quality, white balance, ISO correction, Image tone, Saturation, and contrast can also be adjusted. I would guess the Canon EOS 5D Mark III has a similar function? David Allen criticised my teacher saying how there was more into setting unsharp mask than using set figures however to start with Amount 175% Radius 1.0 and Threshold 0 that my teacher told us to use does seem to improve things and to me is a good start point. However that was for main Photoshop and much depends on how you have already processed the image. Most people with good cameras take in RAW and be it Photoshop Camera Raw 6.5 or RawTherapee 4.0.11.1 there is some sharping likely done as you adjust before the image becomes a jpeg and to sharpen twice may not be a good thing. The idea of teaching some one how to process an image in Photoshop then once they have learnt how to do it all point them into using Raw and then starting all over again showing them how to do it all in Raw seems a little counter productive. So I would start using the RAW program even if still shooting in jpeg as no point in learning how to do it all twice. I would agree basic post processing workshop good idea but the problem is the skilled members of the club use expensive programs be it Photoshop, Light Room or Elements but beginners use free programs like Gimp, RawTherapee, Picturenaut, and Hugin so although similar controls they are not the same. With Raw in Photoshop we have a Clarity slider but in RawTherapee does not have that but does have options like tone mapping so although both use sliders to adjust in a similar way they are not the same. Even swapping from Raw with photoshop CS range to Raw with Elements range means you lose some of the options which again make it hard where some one shows you how for example to use a graduated filter only to find it does not exist on your version. Eric you are really confusing! Jen I like the idea of us giving some help in basic processing. There are several in the club who I am certain would be willing to help. Mike and Kevin are both helping at the beginners group and I am happy to help as well. Eric I would expect a college teacher to be up to date with best practice and what you described being taught was something like 10 years out of date. I'd like to think that these threads are friendly, can we please remember that our text could be perceived as as terse rather than brief. Jen, why don't you raise this on Monday. Knuckles duly rapped. sorry my style is terse and is not intended to be rude but I know at times can be acerbic! Jen that is fab! I love the concept of having the two still whilst the rest are moving. It is so easy to use Lightroom without doing all that. We all need to keep up to date with all aspects of photography and embrace it as it changes. I am a grey haired old fart who loves to keep up with things and not waste time trying to get out of date stuff to match new. Jen, you have a very good eye and good composition in my view. Mike, I totally agree with you. Eric, I used to be involved with a local technical collage, I was amazed how out of date and sometimes wrong the lecturer's were, we had to intervene and get thing right on many occasions. The fact is, no one checks the teachers. I too did a computer course at Deeside Collage, as it was then, only to find out after 9 months that it was all out of date using old course material. It was only when I challenged the lecturer, I found out he did not have a clue. I got my money back but wasted nearly a year. It is all about filling spaces and not the course. I did not know you had light room and I would stick with it. David Allen has been very helpful to me and one of his points was what every software you select stick with it don't swap about. He is also the light room guy and I am sure he will help you in the same way as he has helped me. I think the image is well captured I agree with others a few tweaks are required but since I don't use light room I will let some one else suggest how. Personally I would be well pleased by the image wish it was mine. Jen I have had a look at the picture again with my own laptop. I like the gentle tones of the picture and probably would not want to up either the saturation or contrast. This is very much personal taste rather than a right or wrong. It was interesting hearing David Noton commenting on how he generally avoids upping saturation of his pictures and tends in the opposite direction. We both came away from his presentation last night going wow!